Emirates Airline is a user of Wavetec provided Queue Management solutions in about 71 stations worldwide and this number is rapidly increasing. 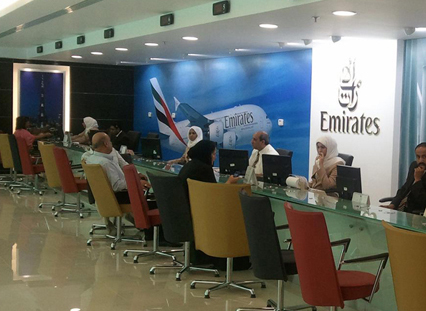 We provided Emirates with a complete end-to-end solution handling all their customer management needs. With Wavetec’s central reporting and management software Emirates can monitor the progress in all of their offices, worldwide, from the Emirates head-office based in the Dubai, UAE. The central reporting software has helped them to benchmark and check the service times in all of their Wavetec connected branches globally. The data from this software is also used by their Human Resource department to check the performance of their employees. Wavetec’s system made for Emirates allow endless opportunities to customize the solutions as per the needs of Emirates. 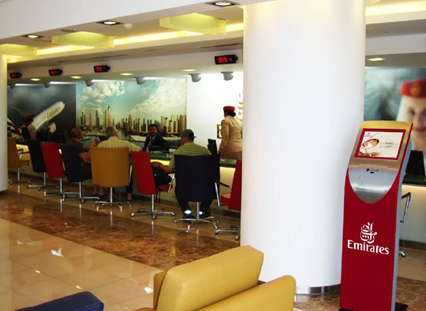 A very evident example is the branded kiosk which is customized to match the corporate color and theme of Emirates. After a thorough analysis of Emirates needs, Wavetec provided them with a complete end to end solution comprising of an electronic queue management system and a fully customized central reporting software. Wavetec is now representing Emirates in more than 60 countries globally. All Emirates stations powered by Wavetec are equipped with a smart L.C.D. touch-screen kiosk. There are more than 20 categories in the kiosk from which the customer can chose, which means that when the customer is called to the desk the Emirates representative is fully prepared before hand to serve the customer. The smart kiosk also has the ability to identify and categorize customers which also enables priority calling. In all Emirates stations globally, Wavetec provided them with a software to display the ticketing information and alongside that information, different promotional messages and advertisements on their L.C.D. screens based on the specific needs of every Emirates station worldwide. A central reporting software was provided which showed the progress of all the Wavetec connected branches worldwide. As a part of the central reporting software, Wavetec also provided Emirates with a live manager dashboard showing live data about active staff, active counters, customers served/waiting and service/wait times with tabular and graphical trend reports. The software provides web based, secure reporting with user access control for different management levels. These reports can be viewed from anywhere around the globe. Organize the flow of customers visiting and effectively allocate the workforce in any Emirates branch worldwide, essentially to decrease the waiting times of the customers. Measure and benchmark service quality levels at all Wavetec powered Emirates offices around the world. Define and measure key performance indicators of staff working at all the Emirates offices globally. To display promotional messages in the waiting areas, educating the in-station customers with all new and upcoming promotions. An automated system to fully manage the customer service of all Wavetec powered Emirates offices. The system provides data which prompts the manager to efficiently allocate all available resources, decreasing the customers’ actual and perceived waiting times and enhancing the customers’ experience. With the feature of priority calling, now Emirates can serve its customers based on their priority instead of a first-in first-out mechanism. The live manager dashboard instantly highlights any discrepancy in the office which might be causing a time lag or any reason which might be causing inconvenience to a customer. This can trigger a swift response from the emirates team to rectify any problems instead of wasting time on identifying them first. The central reporting software enabled the Emirates head office to effectively monitor the progress of all the branches globally and every counter at every office worldwide. It gathers useful data to be used by the service quality assurance department and the human resource department. Each Emirates office is equipped with a Wavetec Smart Kiosk. This is a touch screen ticket dispensing machine. A unique feature of the Smart Kiosk is that it has two ticket printers to ensure operational continuity. In the waiting area, a Digital Signage Solution integrates seamlessly with the EQMS system to display the status of the tickets and promotional media on a shared LCD screen. The solution allows centralized management and control of the content being displayed on screens in Emirates offices globally. In addition, idle-time scrolling messages can be displayed on all LED counter displays. In line with Emirates’ focus on customer care, Wavetec designed a matching engine that routes the customers to a specific service staff based on their needs. For example, if staff members speak English and Spanish, and a customer selects Spanish on the Kiosk, the customer will be routed to a staff member who speaks Spanish. This simple, but effective, feature makes it easy for Emirates staff to make the experience hassle-free and pleasant for all customers. Emirates Airlines is now using the Wavetec Enterprise Queue Management Solution (EQMS) in more than 60 countries across the world and the network continues to expand. There were two key focus areas of the solution designed by Wavetec: (1) Emirates’ customers must feel relaxed and looked after and associate this quality with the Emirates brand, and (2) Emirates’ staff at all locations should spend maximum time providing customer care and delivering service compliant with quality standards, least distracted by tasks that can be handled by technology –in this case by the Wavetec’s technology.